We say it over and over again, “What is your inspiration?”. We can’t make the cakes we do with without it. And Ron is constantly encouraging us to “see” all that is around us, to use everything and anything as a source of inspiration. One of our bride’s and friend Sofia, recently brought in all the things we ask for when designing a wedding cake: pictures of flowers, the dress and a copy of the invite. 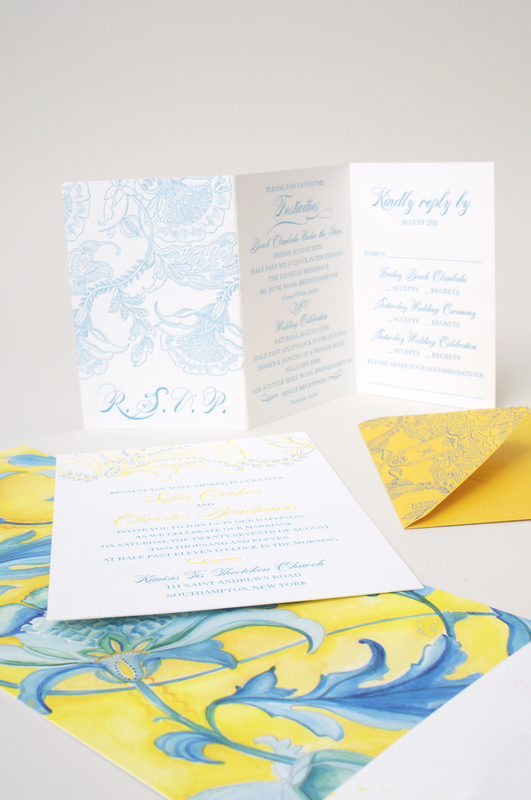 When she handed over her invite to Ron, he said, “I already know what to do!” Her invite was designed by Ceci of Ceci New York and the colors were absolutely gorgeous! Sofia & Chris's invites designed by Ceci New York. 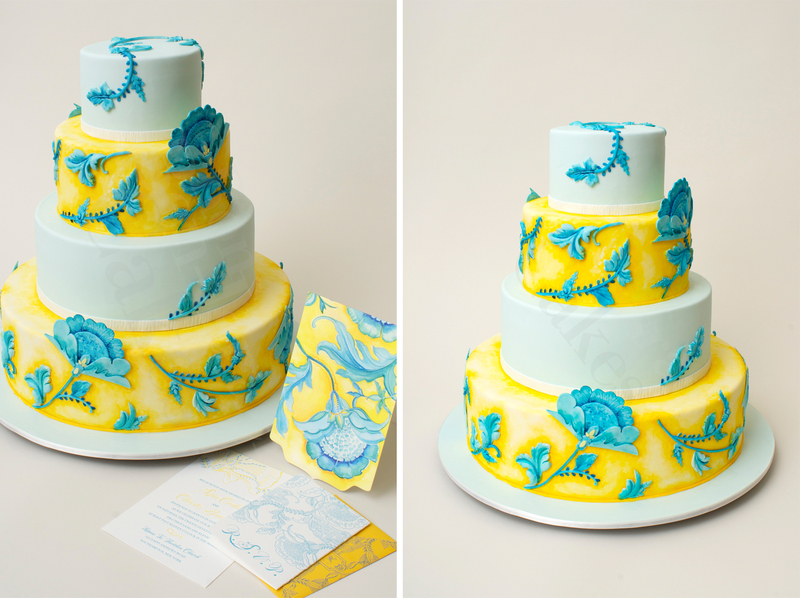 Ron ran with the color scheme and did alternating fondanted cake tiers in blue and yellow hues. He instructed his staff to deconstruct the intricate flower motif to sculpt and mold out of sugar. We are not one for painting on our cakes, but we needed to bring out the details, so we used edible color powders to enhance the molds complex designs. Ron wanted the cake to have the same feeling as the invitation. To achieve this, edible color powders were used to highlight and low-light the sugar molds. Color makes us very happy. We love the white wedding cakes we do, but we also love it when our clients are not afraid of color. Beautiful interpretation of the invitation! I love it! This is amazingly beautiful. I love color! And your blog is one of the best. I really enjoy your posts. So fresh and, dare I say it,…inspiring! My favorite color is yellow as it always makes me happy.